The E30 generation BMW 3-series offers one of the better combinations of decent power, fun chassis, manual gearbox, and style for very basic money. BMW built 2.3 million of the compact executive sedans over the years, so supply should outlast demand for a few more decades. If you want my opinion, the one to get (aside from the murderously expensive M3) is the post facelift (1987+) 325is two-door which is what you are looking at here...but things aren't always as they seem. 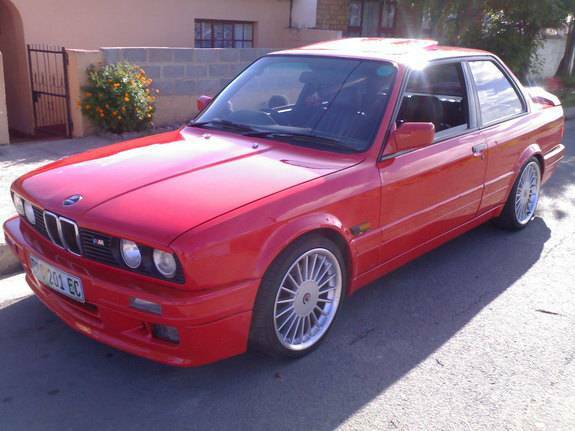 Find this 1989 BMW 325is E30 offered for $6,000 in Anchorage, AK. Tip from Zach Z. Thinking of selling my baby. It's been in the family for 15 years. It still rips and looks great rolling down the road. Okay, great -- the car has been in the "family" for 15 years, looks/rips -- good stuff. I'm not super motivated to sell but have been getting a lot of people asking if I want to. I'm seeing whats out there. I never know what to make of seller's who say they aren't super motivated -- and it sounds like the seller is being coerced by "a lot of people" to sell his car. Buy, who am I to judge? Photo is not of actual car, but very close with similar body kit. Because it it too difficult to take an actual picture. Maybe he should have a picture taken with someone's gross looking finger blocking the front of the car. You never know who will look up your plate and come to your house to steal your ride. In fact We should all start covering our license plates with giant finger stickers for when we are driving around. Someone might read it on the road or in a parking lot. Honey, you have to decide. It's either me or that car. Honey? Honey?? I love the "testing the waters" guys. You have to imagine there are a lot of hurt people out there when they find their "mods" have actually made their car worth less (or worthless). "not a picture of my car"! Do we need to assume that, as with every 'not actual' photo on the internet, reality is something closer to this? This is more along the lines of "here is a picture of the hot celebrity people say I most resemble"
Hmm, the Nigerian naira must be doing well if ₦1,000,000 NGN is converting to $6000 USD instead of the $2351 it usually does in these ads. I wonder how much shipping from Alaska would be.